The Theory of Everything is an ordinary film about an extraordinary life. Director James Marsh takes a conventional approach to telling the complex life story of brilliant physicist Stephen Hawking, one of the most fascinating figures in modern history. 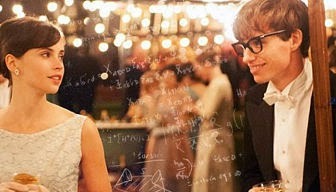 For their performances alone, The Theory of Everything might be worth a watch. Evidently, this true-life story has been Hollywood-ized for awards recognition and mass appeal. I’m going with two-and-a-half out of five. A great improvement from Interstellar’s high handed science jargon, The Theory of Everything talks simple without being condescending. A film as strongly scripted and impeccably executed as The Theory of Everything will be remembered for longer than Stephen Hawking’s estimate of the end of time. That said, the film could have been better off with a shorter runtime. SCIENTIST Stephen Hawking is still looking for that “one simple equation that explains everything”. The person Stephen Hawking knows better than most that life itself has a way of bucking theories. This film, despite a virtuoso performance by Redmayne and a great effort by Jones, doesn’t allow him that courtesy. Except for minor issues; like grainy frames in the visuals of the family picnic scene and parallel editing when Stephen and Jane are cuddling their first born, which seems like the couple are having twins, the film otherwise is a masterpiece. The Theory of Everything is a noteworthy film that features stellar acting, combined with wonderful music and direction. It takes a heartbreaking yet inspiring story, and marvelously depicts it on the screen. Though it may not be the film for viewers who want a brutal biopic, it’s still a film you can’t afford to miss.